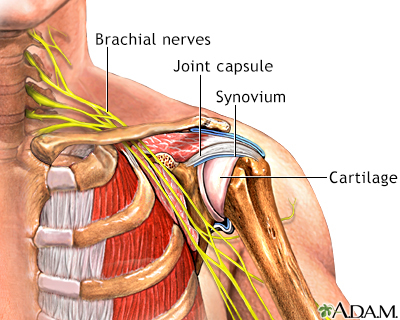 The shoulder joint is a ball-and-socket joint and is the most freely moving joint of the body. The shoulder joint can move in multiple directions therefore it is less stable than other joints and is more susceptible to injury. Dislocation of the shoulder joint is common and occurs when the top part of arm bone slips out of its socket.